Weathered fabric glove w/ elastic wrist band. Listen. We don't condone murdering children in their sleep. Dreams are supposed to sacred, you know? And yeah, we guess children are also precious and important, too, blah blah blah. But we also know that back in the olden days, you could build a factory and just hire a bunch of little kids to work in it for pennies on the dollar, so who are we to say that times aren’t changing? The point is…what you do in your private life is your business. If you wanna enter the dreams of some innocent teenagers and haunt them to their deaths, then we guess it’s probably none of our business. We sometimes stream movies from the internet. And maybe every so often, a New York Times Sunday Edition has ended up on our breakfast table instead of the neighbor it was intended for. What we’re trying to say is, we all do some things that might be outside the lines, okay? So if you’re really committed to this whole being a terrifying villain of nightmares thing, then we still support you as a human being, even if we can't support the actual things you do. And just like any (former) human, you deserve access to the tools that will allow you to express yourself. 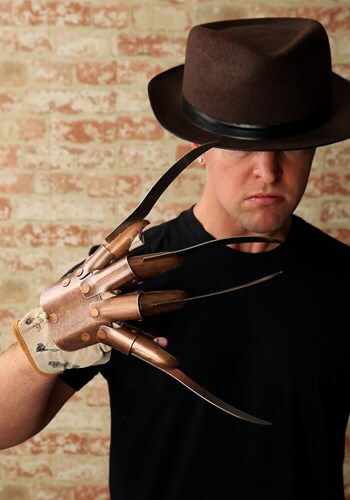 On that end, this Replica Freddy Krueger Glove will help you feel more like a whole person. It's made of scoured metal, and the fingers move with yours, which is kind of symbolic of melding into the person you want most to become, don't you think? The blades appear razor sharp but are dull for safety, because we don't want you to hurt yourself or others while you're on this path of rediscovery! The weathered fabric glove with an elastic wrist band looks pretty horrifying, but again - you gotta do you, boo! Pair the glove with the entire Freddy Krueger costume ensemble, and you'll be able to step in the nightmares of your dreams!